Price is $3.75 for one lug. Minimum order qty is 4 (four) lugs. Tough enough for an impact gun, yet super light. Lightweight Forged 7075 T-6 aluminum hex lugs. * 19mm hex* Open end to clear extra long studs* CNC milled and radiused edges* Threaded through entire length of lug * Less than half the weight of steel lugs, 25g. This design is as light and strong a design as possible, just like the 6UL. Notice no 90* angles, chamfers and radiuses everywhere = no stress risers. Will not rust. 19mm hex is not a random size. Much stronger than 17mm and far easier to get a socket onto that 21mm lugs. If you're taking wheels on and off a lot for racing these details matter! Silver anodized with laser etched 949RACING logo. 4 required per wheel. 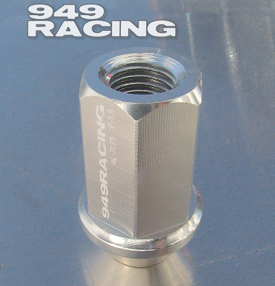 Silver anodized with laser etched 949RACING logo.